The Infoblox Technology Alliance Partner Program is designed to meet customer demand for solutions that seamlessly integrate. The program integrates solutions across security, network automation and cloud and helps partners provide enhanced capabilities for joint customers, while expanding their business opportunities. The Infoblox Technology Alliance Partner Program is designed to meet customer demand for solutions that seamlessly integrate with each other, exchange data and intelligence, work with existing workflows and make the infrastructure they already have more effective. Through a highly interconnected contextual ecosystem, Infoblox Ecosystem Exchange enables integrated solutions that extend security, increase agility, and achieve situational awareness for more efficient operations, on-premises and in the cloud. It provides visibility across the entire network including virtualized or cloud deployments, automates IT workflows, enables faster remediation of threats and increases value of existing investments in security and networking. Infoblox Technology Alliance Partner Program has several vendor integrations across security, network automation and cloud. Membership in the program has helped partners to provide enhanced capabilities for joint customers and expand their customers base and prospects. 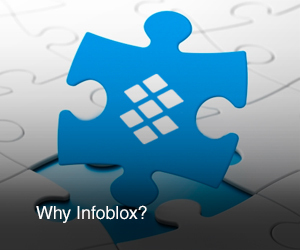 To become an Infoblox technology partner, register here. Disclaimer: Each of these integrations are supported by either Infoblox/Partner/Both. Integrations could also be community supported.